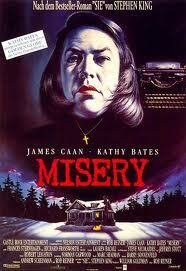 Do you guys remember Stephen King’s psychological thriller Misery with the awesome Kathy Bates and a tied to the bed James Caan? Did it scare the bejeezus out of you too? It terrified me let me tell you. In fact all of Mr King’s books terrify me – especially Salem’s Lot. I still can’t watch that one alone. I need a big strong man snoring on the couch next to me. H simply doesn’t get Vampires. Fans of this blog *waving atcha* might have spotted that August occasionally drops by to comment if something catches her eye. And she sneakily quietly released her book just before Christmas but it didn’t take long for her work to make my radar twitch. I began hearing good things about this book, like how it terrified a certain children’s author Lynn Kelley for example. So I bought it. And I’ll be honest, I’m nervous of psychological thrillers because they tend to remain in my overactive imagination, which is why I write romance. And just as I’d expected, this one lingered for far too long. Think sleepless nights. Thanks for that, August. I left this review on Goodreads. “Fans of Mr King and Mr Koontz will love In Her Shadow. Psychological thrillers are not my usual reading candy but once I was immersed in the story, I couldn’t stop reading until the bitter end. The author’s main characters are well developed and linger in the mind – the sign of a good author. This is an edge of the seat read with parts that made me wince. Eating disorders are always heartbreaking and the author doesn’t pull her punches in tackling the psychological fall out either. And here’s August, she looks perfectly normal doesn’t she? Just goes to show how looks can be deceptive. The woman has a gruesome imagination. 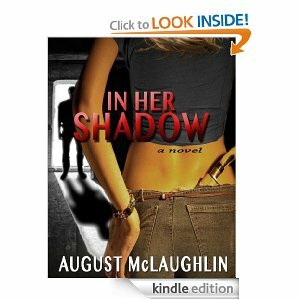 According to her bio, the stunningly beautiful (physically and in her heart) August McLaughlin is a Journalist & author of psychological thriller, IN HER SHADOW. Former model/actress, dream-seeking lifer. Compulsive blogger,#GirlBoner founder. Rep’d by @DGLM Los Angeles, CA. So what books have lingered too long in your mind? Have any kept you awake at night worrying about what happens next? Or have any scared you so bad you’ve left the light on? Come and share them with us! This entry was posted in Debut Author, writing and tagged A Stormy Spring, August McLaughlin, C C MacKenzie, comtemporary romance, debut novel, In Her Shadows, Ludlow Hall Series, Psychological thriller, Reckless Nights in Rome, Run Rosie Run by CC MacKenzie. Bookmark the permalink. I’m with you, CC. I’m a wuss when it comes to reading scary stuff. Congrats on making such an impression on your readers, August!! Best of luck with In Her Shadows!! What draws you to the darker side of romance, August? Thanks, CC, for making my day, and both of you for the happy wishes. 🙂 My best back atcha! Cool!! Okay I’m sending this to my hubby, it’s just what he needs n he loves the scarier the better. Congrats to you August as I’ve seen your face around n you do look soooo normal 🙂 ! August’s book was already on my TBR list, but you managed to move it up more than a few spaces. It’s an excellent read. Good job I write romance, can you imagine what I’d be like if I even attempted a psychological thriller??? No, neither can I? You rock, Karen! Sounds like a great read! I haven’t read any thrillers lately because I don’t get much time to read, and they’re not my first choice. (Yes, I, too prefer romance) The last two I read that I really liked were Into The Dark by Stacy Green, and Smilodon, by Alan Nayes. Holy crikey! Koontz AND King? Leave the lights on and dont read alone. This is one book I cant wait to read. I gravitate to the dark side too, and you would never there is behind August’s lovely face…but I like hidden surprises! My hubby always ask how I can write the things i do…does yours too, August? Nice review and congrats, August! I am glad you reviewed this! I’ve been curious and have the sample on my Kindle but haven’t gotten around to reading and buying. I don’t read psychological thrillers, but this one came at me from the left field. A great debut. I just downloaded it and am looking forward to a great read! What an awesome write up CC! You’ll be fine. You’re dealing with coyotes! Mr King is the King of chills!